So you are in the city but wish to view animals? Other than the National Zoo located near to the Batu Caves, the Malaysian government has also allocated a small space aside for gentle, meek and elegant creatures: the deers. The deer is certainly a popular creature that has appeared and stared in many Malay legends and myths. The species of deer that is most popular here in Malaysia is the rainforest mouse-deer. The Malay word for this particular species of deer is the Kancil. It is one of the world’s smallest four legged animal. If you are in the city of Kuala Lumpur and would like a quiet, lush and beautiful spot, the KL Deer Park is one perfect place to be. It is a part of the city that is most peaceful, away from the heat, traffic and bustling pace that is feature of the city every day. It’s a quiet and safe place to bring children as well. Children will certainly be mesmerized in this magical park. The shrubs, trees and even flowers in the deer park make this place very enchanting to have a beautiful picnic for two or even with the entire family. 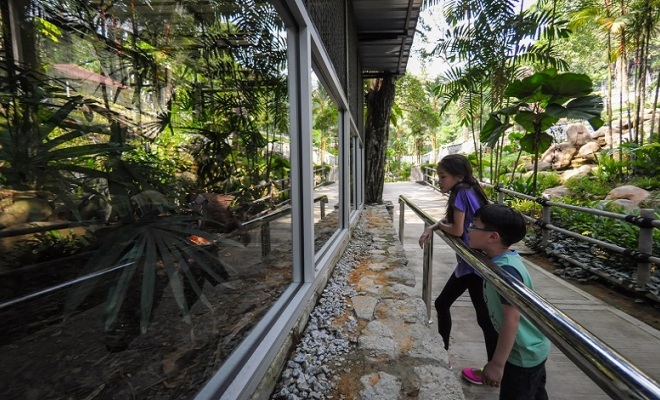 What better place should a child be in to end the holiday in the city of Kuala Lumpur as they will be able to get up close with the deers? What makes this place a very special tourist destination to be in is as the deer roam around the park freely, unaware of the human visitors that have entered their territory. Children can get up close safely to every deer and feeding is allowed here in the park. Not forgetting the landscape. The deer park has been beautifully landscaped and properly maintained. The deer park is opened daily from 9 to 6 p.m. and is a great place to start on your nature escapade, with the bird park, the hibiscus garden and the orchard garden waiting only a few meters away! Getting to the deer park is easy. Either by taking a cab with instructions to the Deer Park of Kuala Lumpur or take the KTM train services and alight at the Old Kuala Lumpur train station. Once you have made your way to the national mosque, a magnificent mosque you can spot the Lake Gardens. Or, if you prefer the bus as your mode of transport, the RAPID KL bus B101 goes this way. You can get down at the Daya Bumi Complex and then take a brief walk towards the Lake Gardens behind the National Mosque.